After the Bulfin’s had returned to Ireland, Eamon was one of the first students enrolled in Pádraig Pearse‘s Irish language school Sgoil Éanna (St Enda’s). He forged a strong relationship with Pearse, and after he had graduated, he assisted with teaching at Sgoil Éanna, and continued his own studies at University College Dublin. In 1913 he joined the Irish Republican Brotherhood, and later became a bomb maker, as preparations for the Rising gathered pace. The Rising began on April 24th, 1916, and Eamon Bulfin soon found himself on the roof of the General Post Office, bestowed the honour of raising the flag that proclaimed the Irish Republic. There were two flags on the Post Office. One was given to me. It was the ordinary Irish flag, green with the harp, and in white letters (inscribed) across the middle were the words “Irish Republic”. I can’t recollect who gave it to me, but I think it was Willie Pearse. The thing I remember most clearly about its hoisting is that I had some kind of a hazy idea that the flag should be rolled up in some kind of a ball, so that when it would be hauled up, it would break out. As a matter of fact, I did it that way because it did open out in the proper manner when hoisted. That flag was floating on the Prince’s Street corner of the G.P.O. I think Willie Pearse was there when it was being hoisted. Whatever number of men we had – twenty or twenty-five – were all actually present. It was in the corner of the Post Office, behind the balustrade. I think both flags were put up about the same time. I have no recollection as to who put up the other flag, but I think it was a chap whom we afterwards knew as Redmond. He was one of the Liverpool-Irish in the Kimmage Garrison, and I think his real name was Joe Gleeson. I don’t remember Gearóid O’Sullivan being there, but I did not know him at the time and he may have been there. The Rising would last for six days, before the vastly superior British military blasted the rebels into submission. Despite suffering heavy casualties in the early exchanges, the crown forces succeeded in surrounding the rebel strongholds, bombarding them with heavy artillery and forcing the inevitable surrender. Retribution was swift. More than 3,500 people were arrested, many of whom had played no part in the revolt, but were nonetheless interned in camps and prisons across Britain. For Pearse and the rest of the leaders, there was no such ‘leniency’. General Maxwell arranged the courts-martial, of those deemed responsible, and most dangerous to British interests in Ireland. Without affording the accused any option of defence, the illegal trials began on May 2nd 1916. The following day, Eamon Bulfin’s close friend and comrade, Pádraig Pearse was executed, along with fellow signatories of the Proclamation, Thomas Clarke and Thomas MacDonagh. The actual flag which was raised above the G.P.O. by Eamon Bulfin, on Easter Monday 1916. The flag was returned to the Irish State by the Imperial War Museum in 1966, to mark the 50th anniversary of the Rising. Thirteen more executions would follow, and among the number scheduled to die thereafter was Eamon Bulfin. His death sentence was ultimately commuted, perhaps because of the fact he had been born in Argentina. He was interned in Frongoch Internment Camp in Wales, before eventually being deported to Buenos Aires. In his absence, Bulfin maintained a line of communication with Michael Collins, and was nominated to run for a seat in his father’s home county of Offaly, in the 1920 County Council Election. Despite residing in Argentina, he was elected and immediately appointed as chairman of the council. One of his first tasks of office was to rename the Kings County, as Offaly, after the old Gaelic kingdom it’s lands were once part of. After independence and the establishment of the Irish Free State Eamon Bulfin returned to Ireland. He would live to see the 50th anniversary celebrations of the Easter Rising, and the return of the flag he had raised above the G.P.O. on that Easter Monday. He died on Christmas Eve in 1968, and is buried at Eglish churchyard, near Birr, Co. Offaly. Commemorative manhole cover, honouring Eamon Bulfin, found in Dingle, Co. Kerry. 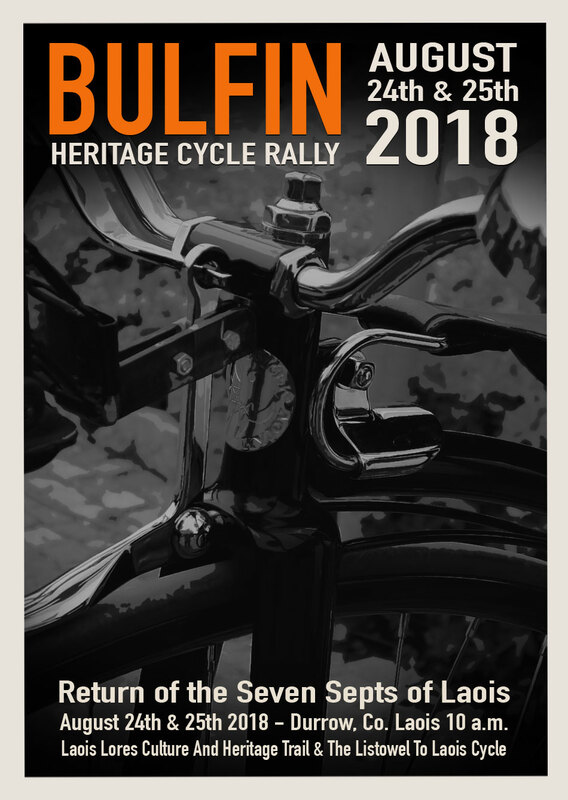 This year’s Bulfin Heritage Cycle Rally takes place on August 24th & 25th, 2018. Two separate Heritage Cycles, will commence on August 24th, and unite at the Rock of Dunamaise, on August 25th, to celebrate the Return of the Seven Septs of Laois. The Listowel To Laois Heritage Cycle, will carry seven torches, each representing one of the families, that were banished from Co. Laois, by Crown forces,and relocated in Co. Kerry. Under Sentence of Death, should they ever return to the county, their descendants remain in Kerry to this very day. But the time has come for the Seven Septs to finally make their return! In cycle convoy, the seven torches will arrive at the former stronghold of Dunamaise; joining with the Laois Lores Culture & Heritage Trail Cycle, to light up a Ceremonial Laois Sept Vessel, at a very special, and unique Heritage gathering on the Rock of Dunamaise.